In spite of one of the warmest Mays on record, we all know winter is on the way and with it comes some of my favourite things. Bracing morning walks with the dogs, snuggling up with comfort food and red wine in front of the fire, clear sunny Highland days and frosty star filled nights. Electric blankets and feather quilts. Slippers and dressing gowns. And the loveliness of The Winter Rose. 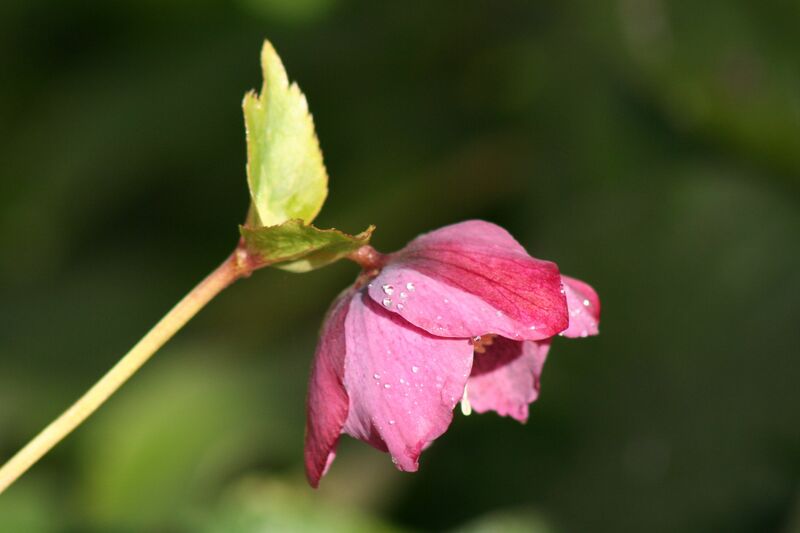 Or more correctly Helleborus niger. I much prefer the common name for this romantic flower. 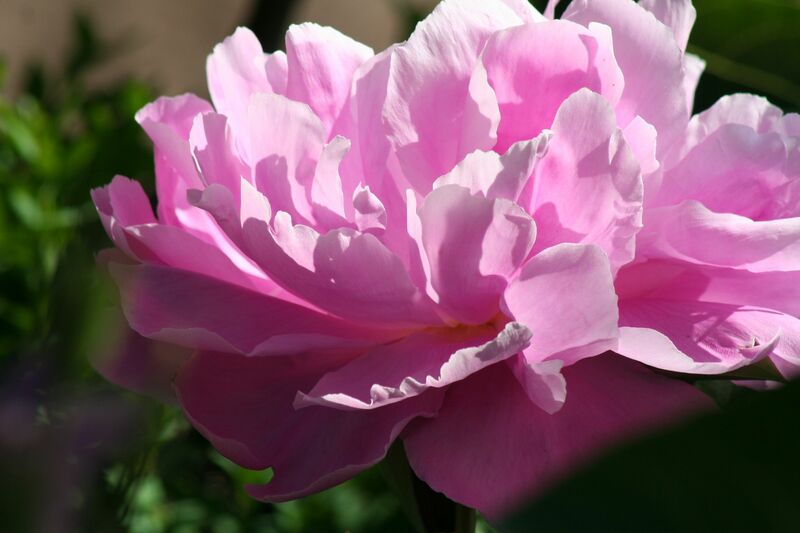 The very name adds glamour to the garden through winter into spring and this plant is indeed to me a winter rose. 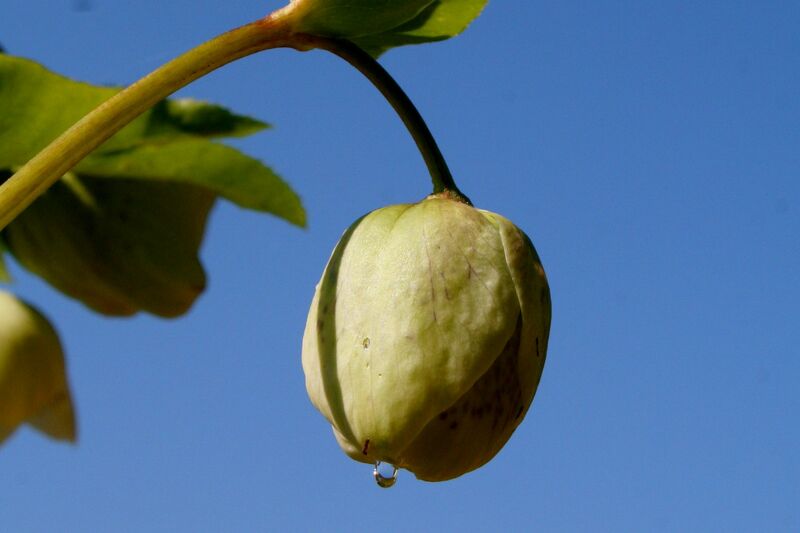 Native to the mountainous regions of Europe, Greece and Asia Minor, Helleborus niger is a member of the Ranunculaceae, or buttercup family. 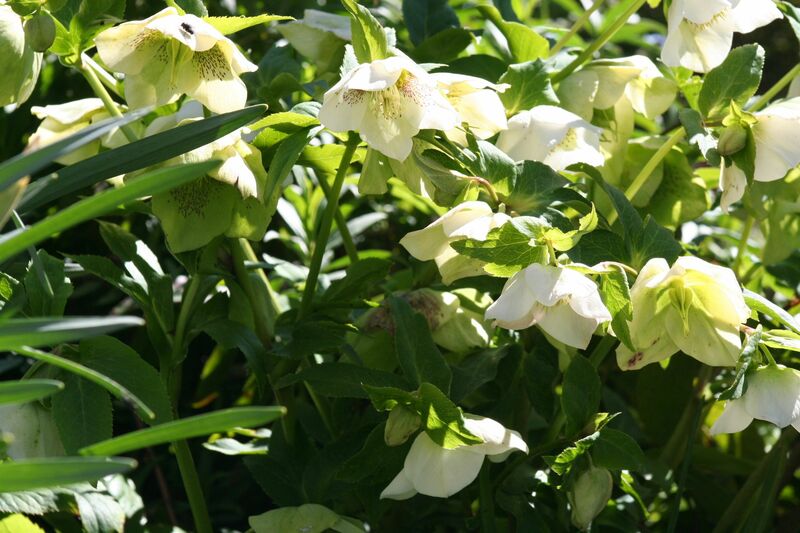 It blooms at Christmas time in the northern hemisphere, hence its other common name, The Christmas Rose. Niger, the species name, means black and refers to its dark coloured roots. 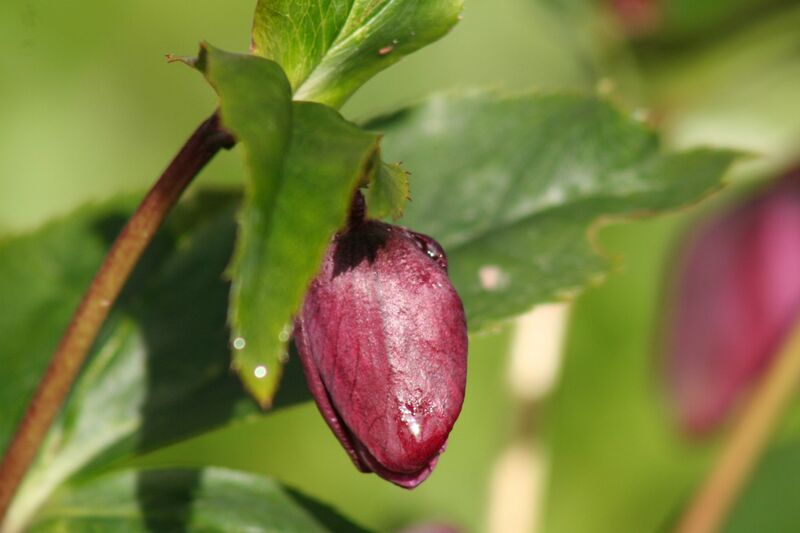 I love this plant at all stages – from the beautiful, elegant buds dripping with dew to the full blouseyness of the mature flowers. 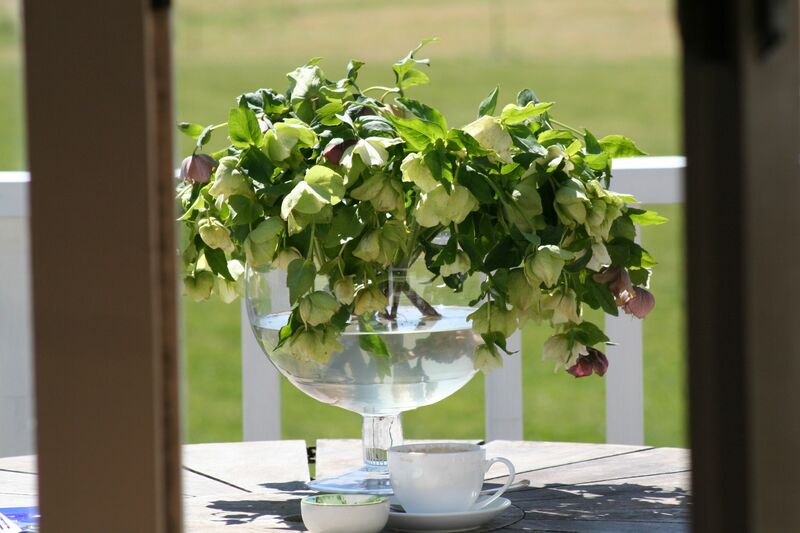 I love them massed in goblet shaped bowls and singly in groupings of bud vases. 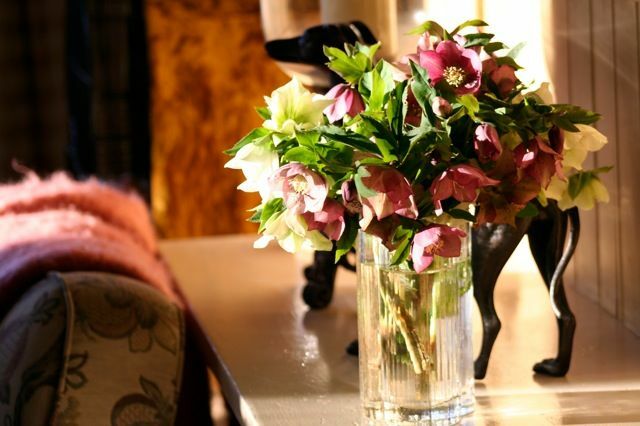 You must pick them as mature flowers or they will wilt in the vase. They also look gorgeous in a float bowl where they will last for weeks slowly fading and changing colour. We have them everywhere in our garden. 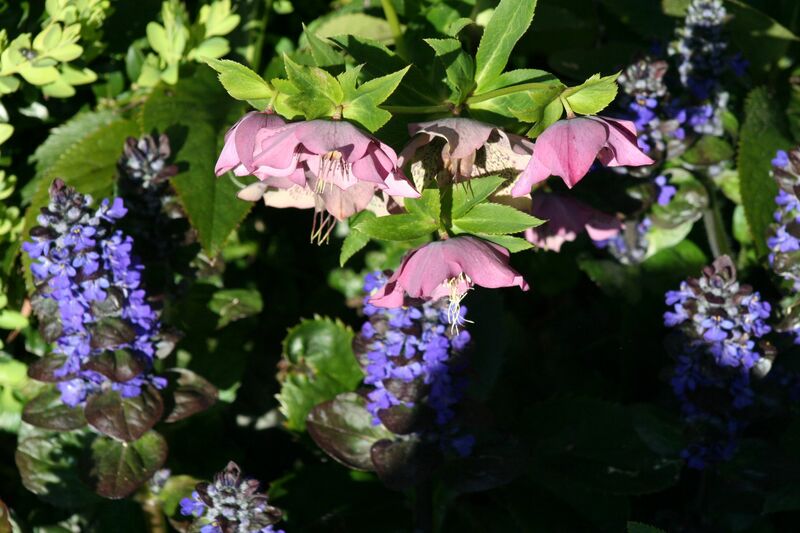 Masses of them are underplanted beneath birches and elms and my favourite combination is with ajuga and euphorbia. 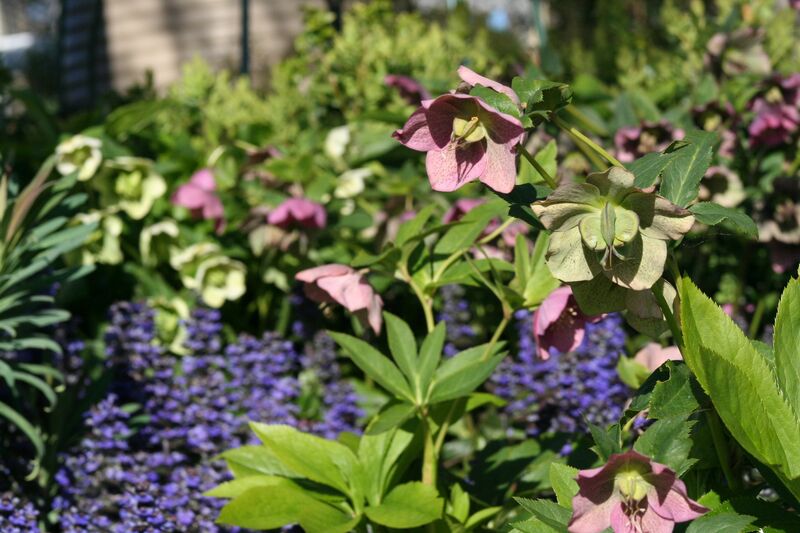 By September they are all in full flight with the soft green of the euphorbia flowers perfectly complementing the creamy green of the white hellebores – while the ajuga adds a stunning blue accent. They’re so pretty in drifts under deciduous trees and also do well in pots. There are lots of varieties to choose from and we will soon be receiving the Winter Elegance singles ‘Burgundy’, ‘Midnight’, ‘Primrose and Cherry’, ‘Shell Pink’, Winter White’ and Yellow Picotee’. Along with the Winter Elegance doubles: ‘Double Burgundy’, ‘Double Pink’, ‘Double White’ and ‘Double White Spotted’. 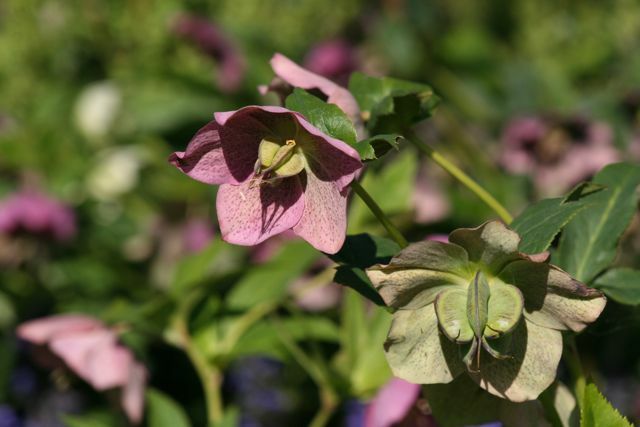 There are also the Winter Elegance species: Helleborous lividus; Helleborus niger, H. x sternii ‘Ashbourne silver’ and we hope also to have tube stock of H. x hybridus in singles and double varieties. 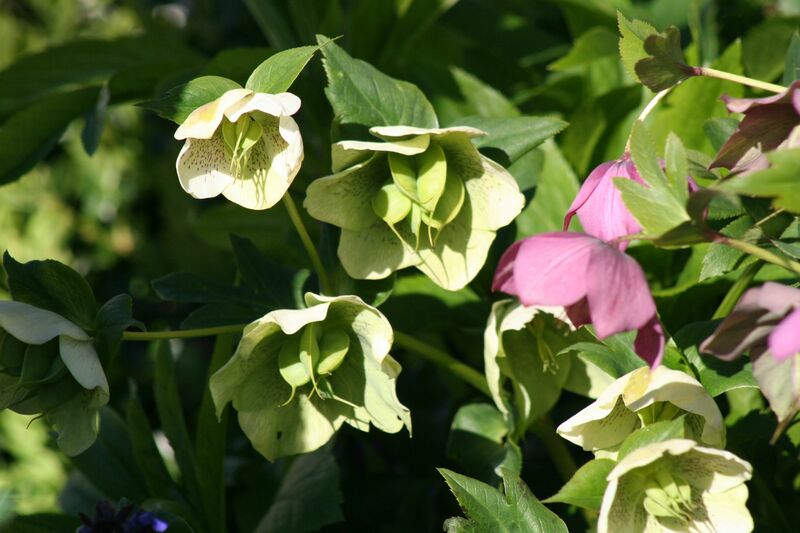 Hellebores prefer a shady, moist situation in alkaline soil but are very adaptable. Ours do well even in the more acidic areas of the garden where they self seed everywhere providing baby plants to gift to friends. At planting time incorporate plenty of compost into the soil and keep them well mulched to discourage weeds and encourage worms. Keep well watered during summer and remove dead foliage and flowers to keep the plant tidy, but otherwise there’s no need to prune. 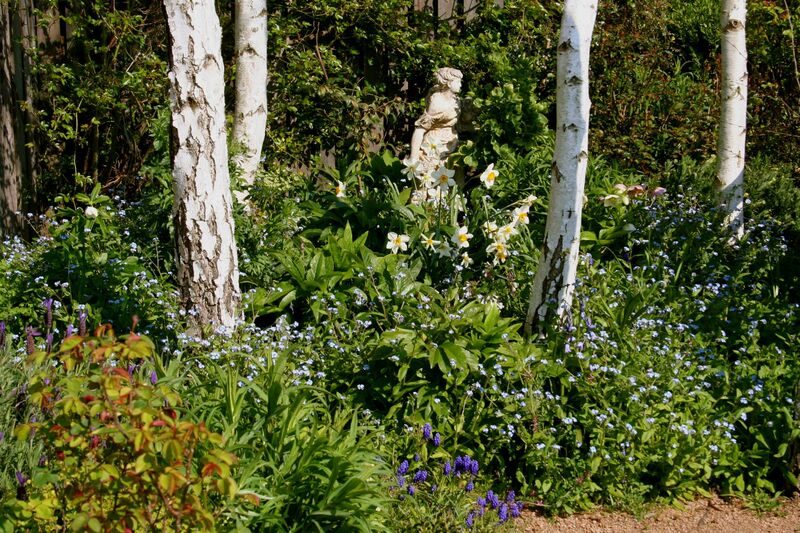 One of the first things we planted when we started our garden here in Sutton Forest was a little walk of silver birches, in those days to screen off an unsightly area of rain water tanks and to soften the house as you approached down the driveway. 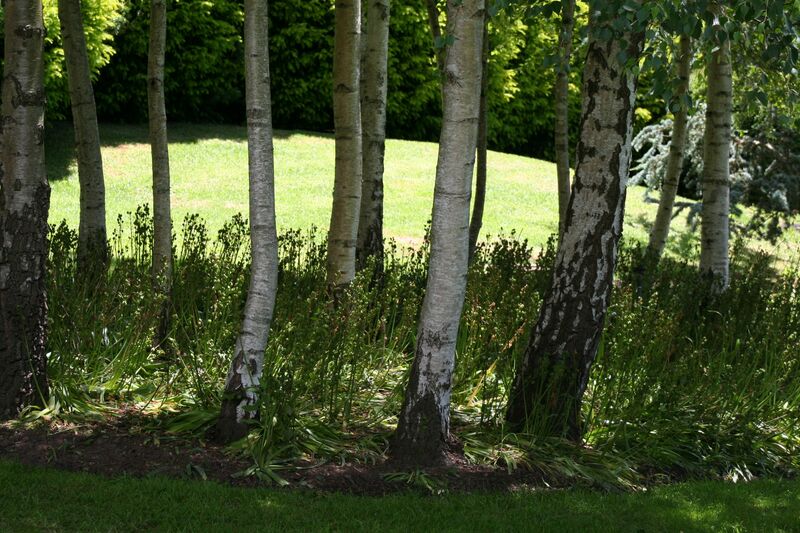 This idea kind of grew and now we seem to have lots and lots of silver birch walks! 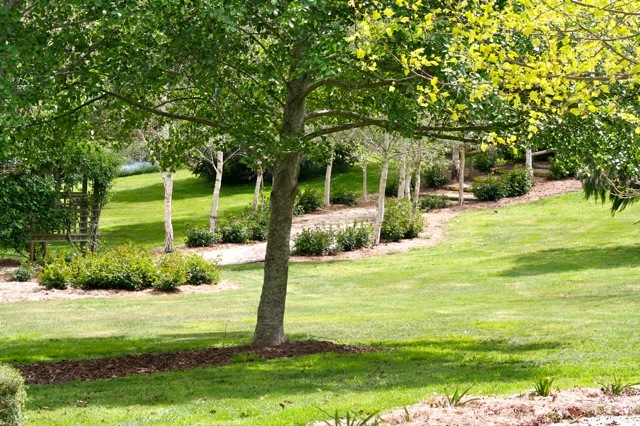 One behind the citrus garden, which shades a pathway leading to the orchard. Another one leads through the perennial garden to the north of the house and most recently, in a spontaneous moment of madness, I bought 300 (or was it 500?) to line the driveway last winter and create some light and shade effects and lead your eye to the house. They grow incredibly fast here in the Highlands and it seems the ones on the driveway love the acid from the pine needles that fall from a stand of pines nearby. Or perhaps it is the 4 inch layer of mulch that gives them a boost. Either way the effect has been almost instant and the little saplings are now already high enough to walk under and will by next summer form a pretty canopy to drive under. For some reason some people don’t like them … I do. 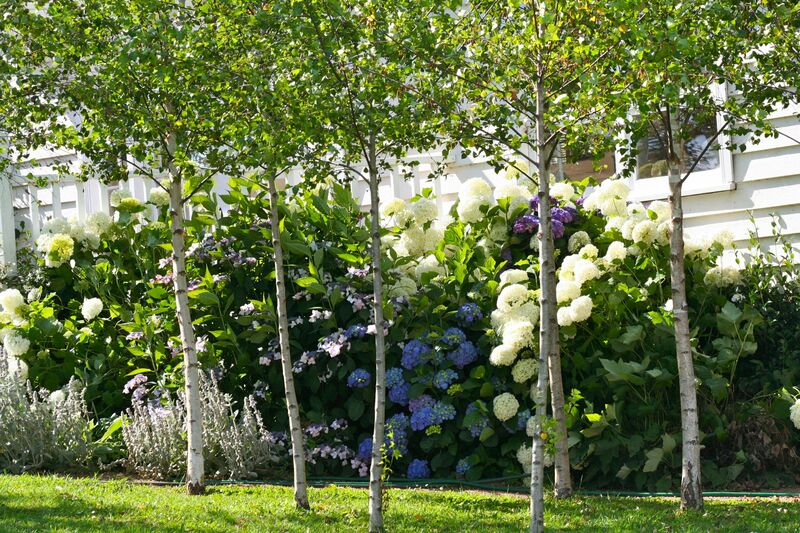 I love them planted really close as they would be in natural woodland, and if I wasn’t responding to pressure to keep them spaced, I would plant them even closer. 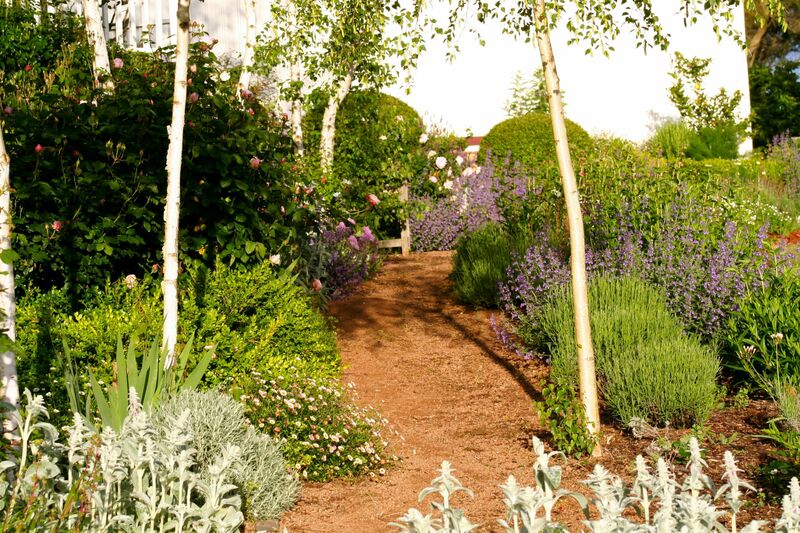 That way the trunks stay slender and look amazing if pleached up really high leaving you with an ‘installation’ of silvery trunks. What’s not to love about them, I say. 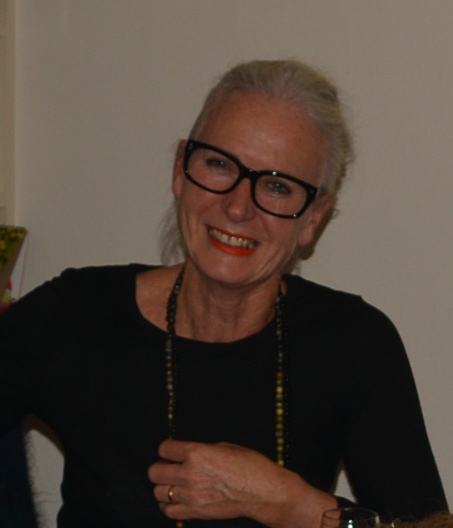 And so, I will definitely be getting some in stock for you to enjoy at The Potting Shed. 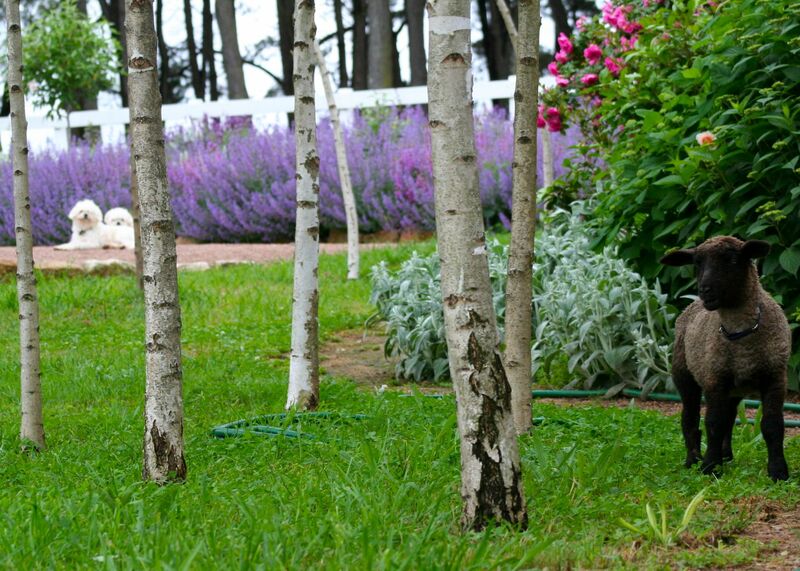 Above: Jack, Harry and Bella lamb chilling in the garden in Spring Above a view of a lovely silver birch lined path at The Burrows in Canyonleigh. Bluebells under birch at Whitley. 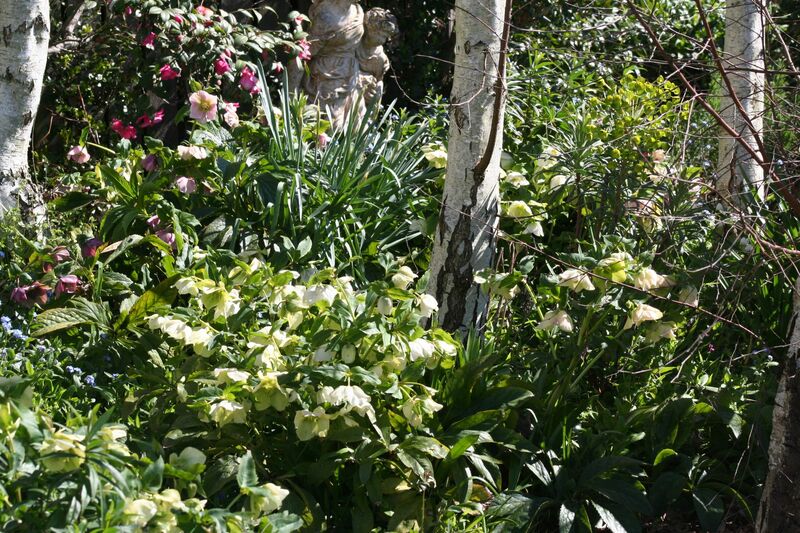 Hellebores and forget me nots in one of our birch stands.